In Sleep Guardian you are a dreamcatcher, tasked with the important job of ensuring the little girl under your care has a good night's sleep. 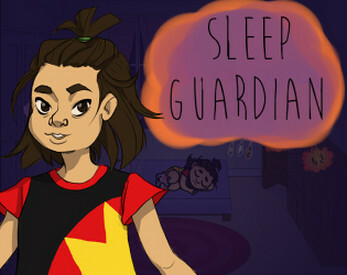 Catch the bad dreams in your web to destroy them, while running into good dreams will give you bonus points. Bad dreams are worth 1 point, good dreams are worth 3, get 20 points to win. If the girl is hit 6 times by bad dreams, you lose! Don't let the bad dreams get to the girl, or she'll have terrible nightmares!